Should only licensed surveyors and engineers be legally allowed to use high-precision GPS instruments to make maps in Arizona? It falls on the heels of a recently dismissed federal lawsuit at the national level to restrict map making to surveyors and engineers (see my blogs on June 15 and May 14). In the wake of that contentious battle, earth scientists are wary. The paper talks about the need for "... surveyors or engineers to take an aggressive and proactive stance against non registrants using this equipment [ ie, sub-meter GPS]..."
The paper does state that, "The GO Committee believes the best approach is to focus on the use of geospatial data and not on the licensing, registration or certification of geospatial professionals as a general rule. The Committee believes that whether geospatial data are used as an “authoritative” location of a boundary or geographic feature is the most relevant aspect of whether geospatial data must be developed by a registered professional." But the options laid out for the APLS members to consider are to "do nothing,"
adopt model national restrictions, or adopt rules like those in Oregon that also include the national restrictions. The National Council of Examiners for Engineering and Surveying (NCEES) model guidelines define land surveying as “… the making of geometric measurements and gathering related information pertaining to the physical or legal features of the earth, improvements on the earth, the space above, on, or below the earth… providing, utilizing, or developing the same into survey products such as graphics, data, maps, plans, reports, descriptions, or projects" [emphasis added]. Clearly this crosses over to the roles of geologists and others. APLS is preparing to develop recommendations to take to the SBTR. Geologists need to get engaged in this debate. 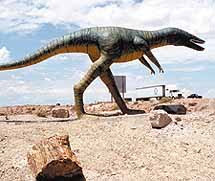 But you better hurry if you want to create your own Jurassic Park - the Holbrook Chamber of Commerce and local businesses are reportedly looking to snap up the remaining dinos. Is the San Pedro River "toast"? The former district chief of the USGS Water Resources Division in Arizona says it is already too late to save the flows of the San Pedro River. In an op-ed piece in todays Arizona Daily Star (http://www.azstarnet.com/opinion/190715), Robert MacNish wrote that "Even if all groundwater pumping in the basin is stopped immediately, the effects of the historic pumping will continue to expand from the pumping centers, and the river will dry up, flowing only during storms." He also said that if pumping were never to resume, "recovery could take more than a century." He called for "agressive, pro-active measures" to be taken immediately or the river is "toast." And concluded that "given the historic responses of the folks in the basin to repeated warnings of the rivers potential demise, it is too late." Dave Shaver retired from the National Park Service last week. In the mid-1990s, Dave played a leadership role in the formation of the NPS' Geologic Resources Division. While Dave was not trained as a geologist, he contributed more to geologic understanding and management of our parks than anyone I can think of. The Park Service needs to recognize the central role of geology in the nations parks, and fill Dave's position with someone who will be be either de facto or explicitly, the Chief Geologist of the NPS, with input at the most senior level of the organization. Many of our most spectacular parks were initially set aside for their geologic qualities, but have no geologist on staff and geology is virtually absent from many park interpretive materials and park plannning. The numbers are a bit squishy, but there are only about 45 geologists in any positions in the NPS (including collecting entrance fees or repairing trails), while there are 900 biologists. No surprise then that the biological features of our parks tend to be emphasized over the geologic ones. In addition, Park managers are realizing the need for better identification of geologic hazards that threaten the parks and park visitors. The increased need for groundwater and places to dispose of waste also call for more geologic expertise in the Park system. The GRD is making huge strides in preparing geologic evaluations of hundreds of park units across the country. Under Dave's leadership, the GRD partnered with the state geological surveys to systematically review the geologic resources and needs in each park in a state. I was fortunate to be invited to the first ever meeting of geologists from across the NPS a dozen years ago, along with Vicki Cowart, then the state geologist of Colorado. The partnership between state surveys and the NPS was developed at that meeting and continues to spread. That will be part of Dave's legacy. Dave also took a risky stance when he challenged the Park Service hierarchy decision to promote a creationist book in the Grand Canyon visitor center that denies natural science and opposes the beliefs of many mainstream religions. The book controversy has attracted widespread attention and criticism. Dave put his persuasive arguments against the U.S. government getting into the position of promoting one religious viewpoint over others, in a letter to NPS management, but to no avail. I hope whoever takes Dave's place in the Park Service will have the strength to continue to fight for the inclusion of good science in the management, interpretation, and preservation of these world-class geologic treasures. Sustainable mining is NOT about the sustainability of mining itself, a specific mine or a resource. Mining per se is not sustainable. That explanation came from Becky Morris of the National Stone, Sand and Gravel Association during a presentation to the recent annual convention of the Arizona Rock Products Association (ARPA). Sustainable mining is about addressing contributions of mining to meet societal needs. She described it as more of a "life cycle approach" to mining. She was followed by Jamie Gaboriau with Aggregate Industries in Colorado. AI has adopted a sustainable mining approach that includes a comprehensive report on all their activities to ensure that the entire operation is transparent, including energy usage, spills, production information and so on. One result is that they are finding that things that used to be considered waste can be turned into profits. For example, reclaimed mined lands are converted to wetlands that fetch $60,000 an acre. 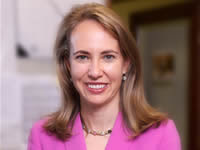 U.S. Representative Gabrielle Giffords told the Arizona Geological Society monthly dinner meeting last night that she is not opposed to mining in southern Arizona but Augusta Resources has not done an adequate job in engaging the community over its proposed Rosemont copper mine in the Santa Rita Mountains, about 20 miles south of Tucson. She said that each proposal has to be looked at individually but she held open the possibility of withdrawal of federal lands for the Rosemont mine. She sounded uncertain as to whether other types of development, such as housing tracts, could be built if the mine was prohibited. She started her talk with updates on the Ft Huachuca - San Pedro River issues and her initiatives to promote solar energy development. She said the Fort contributes $2 billion to the economy but is at risk because of threats to water resources in the San Pedro basin. But Giffords spent most of the evening talking about and answering questions on mining, especially the Rosemont mine. Giffords contrasted Augusta's efforts with those of the Resolution copper mine, which she said had developed strong community and even environmental support. She said the majority of her constituents oppose the Rosemont mine and she complained that the profits from the mine would leave the U.S., noting that Augusta is a Canadian company. She also raised conerns about water resources needed for the mine. A lot of geologists from mining and geotechnical companies were in the audience. Many were skeptical or challenged her statements. One noted that the Resolution mine, which Giffords appeared to support, is also foreign owned (Australian and British companies) and asked why she wasn't concerned about their profits leaving Arizona. Another pointed out that Giffords had also talked about 10 million new residents coming to Arizona in the next 40 years - where, he asked, are they going to find the mineral resources to provide them the necessities of life unless we import them at increased risk to our national security? Someone piped up that to build all the solar panels Giffords wants, they will have to set up the manufacturing plants "at the gates of the copper mines" to make sure they can get the minerals needed. A representative of the steelworkers union told Giffords that mining jobs are the highest paying blue collar jobs in the region and even a small number of them can have a big impact on communities. He reminded her that he had campaigned hard for her election to Congress. Someone else pointedly argued that if Augusta Resources is meeting all the state and federal requirements for responsible mining, should they be turned down simply because there's a "mob that wants to lynch them." That comment drew strong positive response from many in the audience. Giffords committed to a number of questioners that she would continue the dialogue with them on these issues and the entire 1872 Mining Law reconsideration. Governor Napolitano's proposals to restore the AZGS' Mineral Resources Program and start a Natural Hazards Mitigation Program to assist local governments both went down to failure in the just completed Arizona Legislature session. The proposals were cut out early in the appropriations process and we couldn't find any legislative champions willing to try to get them back on the table for discussion. The Legislature also defeated a proposed referendum to remove the State Mine Inspector from the list of elective offices. Arizona has the only elected mine inspector in the nation (and probably in the world).